Restored to elegance in record time, this histroic home proves that fashionable decor and toddlers are compatible. 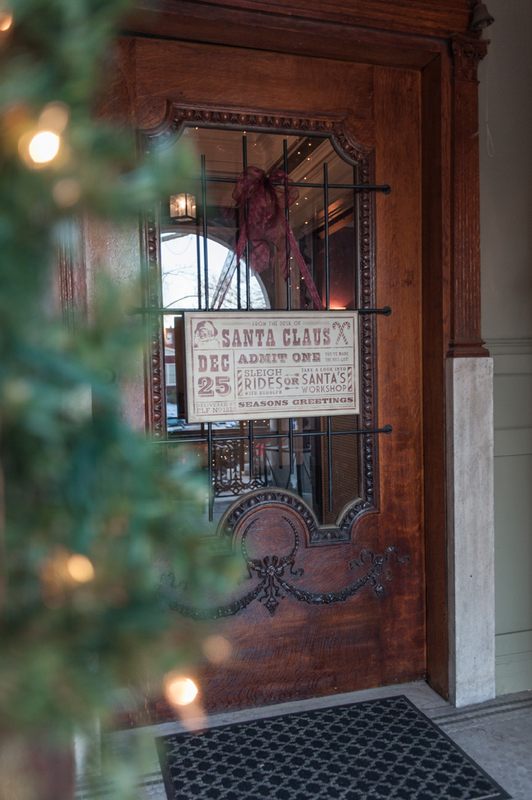 Santa will have a new name on his list when he visits the home of Jassen Johnson and Sarah Kramer this year. Baby Windsor arrived in September and will be celebrating her first Christmas with her parents and two siblings, Hartman, age 3½, and Sloan, 2½, in their beautifully renovated residence in the Central West End. Similarly civic-minded, Sarah is currently on maternity leave, but plans to resume her responsibilities as director of community relations for Peabody Energy shortly. Married for five years, this dynamic couple has created a household full of love, joy, fun and enthusiasm for the arts. Needing more space for a growing family, the couple purchased their 6,650-square-foot, Italianate three-story in 2012. At the time, however, the building was in foreclosure and uninhabitable. To most, the task ahead would have been daunting, but the house met their basic parameters: a historic home with “great bones” inside the city limits. So, they leased their downtown loft and temporarily leased a small apartment. Assisted by family members from their respective hometowns in Illinois and Iowa, Jassen and Sarah managed to make the house livable in just two months, then moved in to complete the renovation. Built in 1898, the home includes seven bedrooms and a sleeping porch, six baths and a four-car carriage house with an upstairs apartment. Renewal efforts started with the kitchen and installation of a high-efficiency boiler system, six air handlers (two per floor) and air conditioning. The lower stories are radiator-heated, and a heat strip on the third floor supplements the warm air rising from below. “This system keeps our utility bills in check,” Jassen explains. The only structural modifications made to the original floorplan were on the main level, where the butler’s pantry was converted to a shotgun kitchen with open breakfast/family dining area and adjacent laundry room, and on the top floor, which was reconfigured into a spectacular master retreat. All of the lighting and windows, except those with leaded glass, were replaced, but most of the floors were in reasonable condition, having been refurbished with dark-stained maple during an earlier renovation. Another consideration was that Jassen favors traditional styling, and Sarah’s tastes tend to be more modern. By juxtaposing elements of both styles in each space, adding an occasional Asian accent and focusing on durable, easy-to-clean materials, they’ve achieved a look that respects the home’s classic character, yet adapts to the family’s active, contemporary lifestyle. Amazingly, in a mere two years, the once-derelict residence has been transformed into one of the finest in the neighborhood. Decorated for the holidays, it’s greeting-card perfect – inside and out. Designed by Jassen, the elaborate seasonal décor is further evidence of his artistry and takes nearly a week to install. Garlands trimmed with white lights and red ribbon festoon the arched-entry porch and balconies. 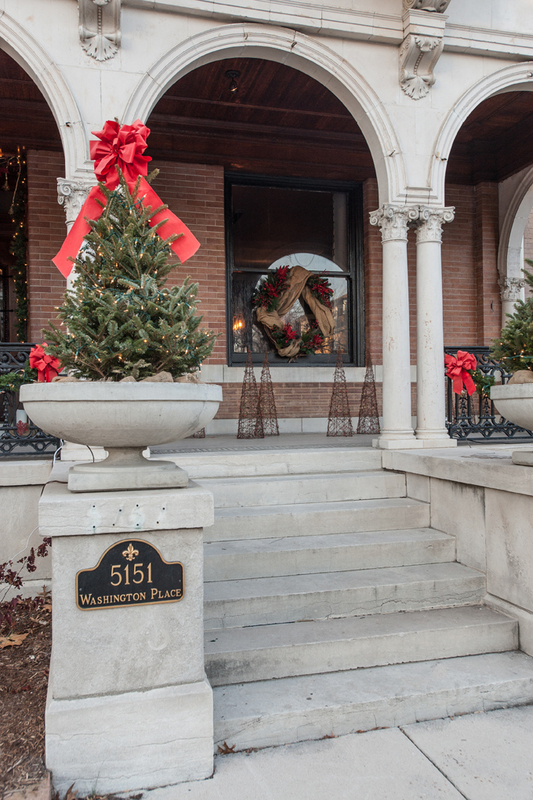 Fresh miniature Christmas trees fill the planters, and the burled-oak entry door issues a welcome to Santa. A row of grapevine-and-berry topiaries and a large grapevine wreath, wrapped with burlap, establish a stylish theme that is carried through to the interior. Open to the third floor, the foyer’s majestic staircase is draped with burlap-wound garland. 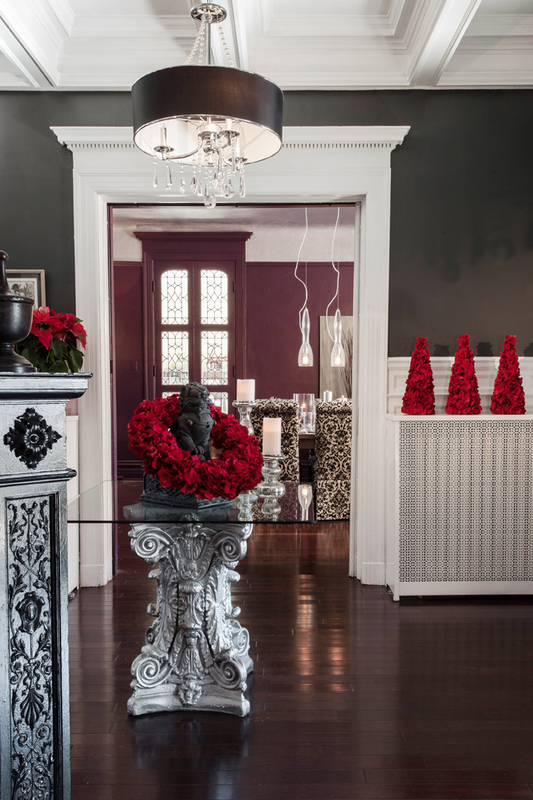 A wreath of poinsettias adds color to the glass-topped center table, which has an ornate gilt-painted base, and poinsettia topiaries lend a contemporary touch. Like most of the furnishings in the home, those in the library came from the owners’ previous loft and are proportionally well-suited to the large, high-ceilinged rooms. The library floor had not been replaced, and Jassen chose to preserve the distinctive pattern of diagonals and insets, refinishing the wood and applying an ebony stain. Boldly contemporary, the walls and ceiling are painted metallic silver, softly reflecting light from the antique chandelier, salvaged from an old downtown clothing store. The library’s nostalgic Christmas tree showcases treasured family ornaments and a pintuck silk garland made from the 90-foot runner that had adorned the head table at the couple’s wedding reception. 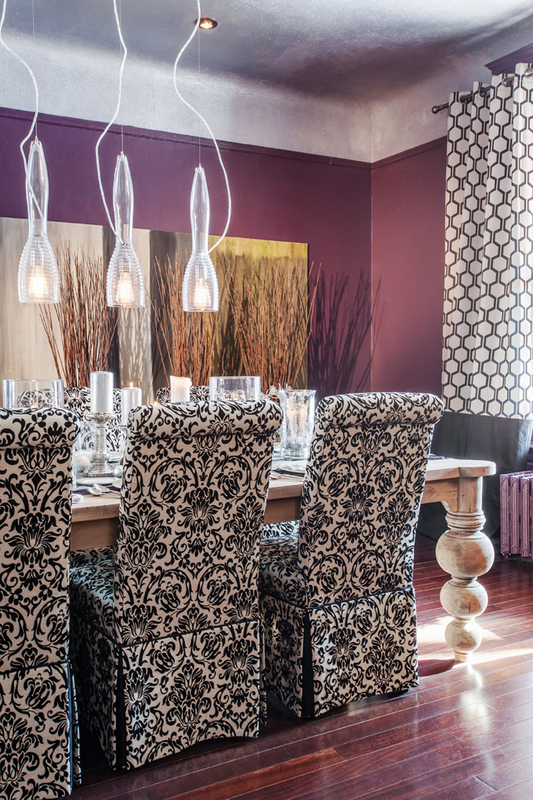 The formal dining room is a sophisticated blend of the owners’ preferred styles and features eggplant-hued walls, an I.O. Metro dining table with a vintage “reclaimed” look and natural finish, an Asian sideboard from Suttonwood Antiques, streamlined dining chairs in a linen/velvet damask pattern, one of several abstracts painted by Jassen and contemporary suspended Edison-bulb lights from CENTRO. 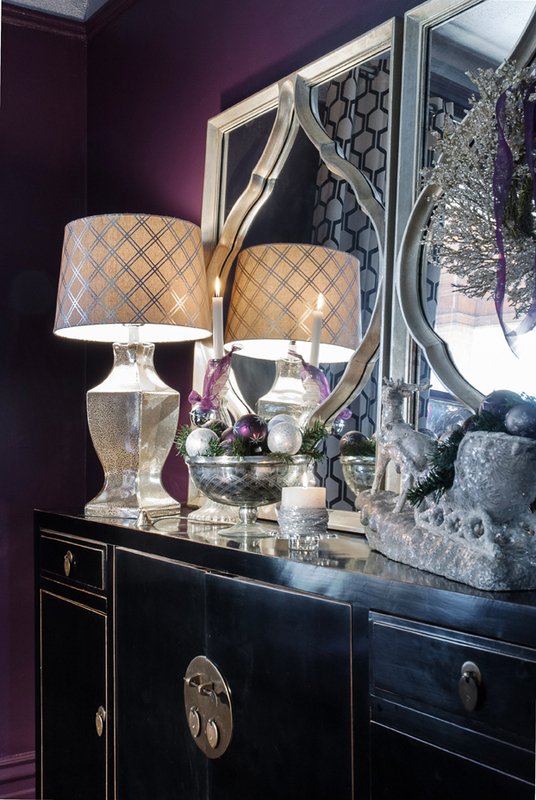 Holiday trimmings in this room emphasize a color scheme of eggplant, white and silver. Filled with photographic records of the children, the solarium is the hub of family activity and has abundant windows, cheerful yellow walls, a baby grand piano and the one original fireplace still in operation. Christmas stockings are hung from the mantel, and Jassen opted for a holiday palette of citrus colors, incorporating fresh limes and lemons and yellow-stained burlap into the garland. Off the kitchen, most family meals are enjoyed in the breakfast room, where a comfortable banquette provides seating for the oversized 8-by-9-foot black-granite island. At Christmastime, a miniature train chugs around the island, entertaining the youngsters, while an audio book of the Christmas story plays again and again. A pass-through permits service from the kitchen to the spacious family room (and allows mom to keep an eye on the children). 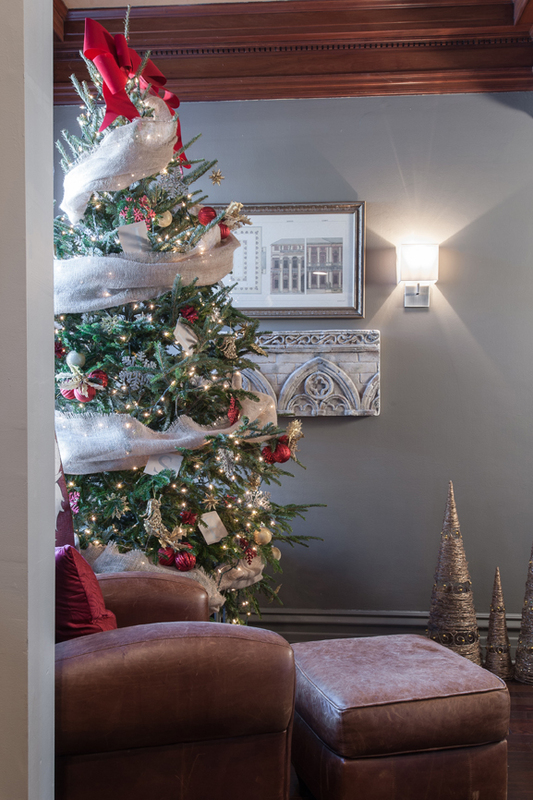 Rich gray walls give the room a cozy feel, and the “reading-nook” alcove provides the ideal location for another tree, positioned above the reach of tiny fingers and decorated with kid-friendly ornaments and Christmas cards. Virtually indestructible, the room’s generous sofa is covered in textured leather, and a metal steamer trunk serves as a coffee table. It’s unlikely that baby Windsor will understand the excitement as her brother and sister tear into their gifts on Christmas morning. But there’s no doubt that Sarah and Jassen will be giving thanks for their lovely home – and these three most precious gifts of all – on Christmas and every day of the year.